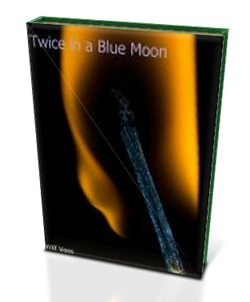 Twice in a Blue Moon is a novel based on Wilf's experience both riding and working with horses. "I enjoyed equestrian fiction, however, with the exception of racing thrillers there didn't seem to be any number of books that dealt with horse people so I thought that I had better write my own!" The novel tells the story of a sleepy country riding school is shattered when one of the staff is abducted. A secret history leads to a terrifying revenge and a race against time to save their life that leads from gangland London to the wilds of Dartmoor. Amanda King is the owner and proprietor of the Redbridge Riding School, a small establishment on the edge of Dartmoor where nothing special ever happens until suddenly a ghost from her past returns to haunt her as mistruths and shared secrets are revealed. It is left up to Adam Bishop to succeed where the police have failed to ensure he saves the his love but will he be able to evade capture himself?